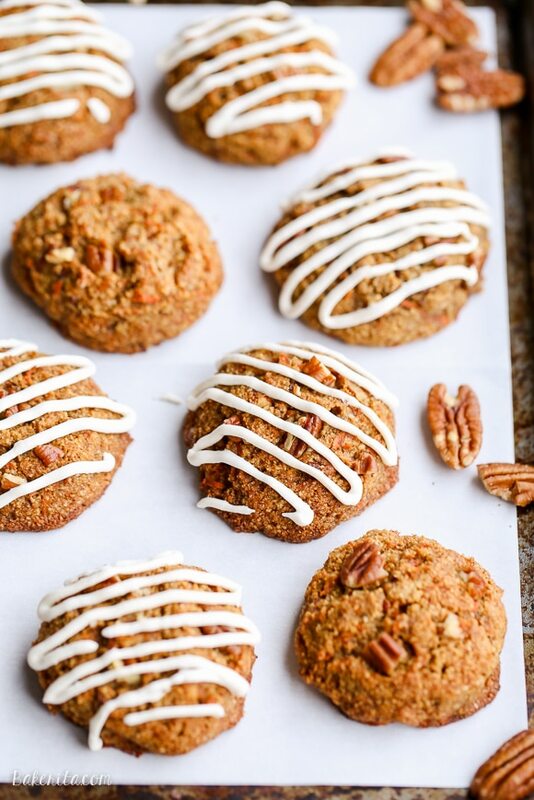 These Carrot Cake Cookies are drizzled with cream cheese glaze and taste just like carrot cake! The cookies are gluten-free, grain-free, and refined sugar-free. These cookies!!! You guys, I’m really really excited about them. I may have eaten a few off the tray while these were getting photographed. And then some more as they sat, staring at me from the table after they had already been photographed. It’s called quality control – I’m doing it for you guys. Really. I’m extra thrilled because getting these cookies right means I don’t have to grate any more carrots. It’s the worst part, truly, and if you’ve got a food processor, I’d recommend breaking it out so you don’t have to grate the carrots by hand like I did. Thankfully, even if you’re grating by hand, you don’t need to grate too many – just enough for 3/4 cup! Let’s talk about these delicious cookies though, besides the carrot grating. I wanted to create a cookie that was gluten-free and refined sugar-free whose flavors were reminiscent of one of my favorite springtime desserts: carrot cake! And not to toot my own horn, but I’d say it was a success. The cookie dough is made with almond flour and coconut sugar, so the cookies themselves are grain-free and Paleo-friendly. I used cinnamon and nutmeg for that signature carrot cake spice and I also tossed in some pecans to add some crunch. To the nuts-in-your-desserts haters, just leave ’em out! You could also toss in some raisins if you’re into that in your carrot cake. Of course, you can’t have carrot cake without cream cheese frosting! I made a super quick cream cheese glaze that sweetened with some maple syrup and thinned out with a bit of milk. The glaze is drizzled over the cookies and the tangy cream cheese flavor really brings the carrot cake flavor home. I scooped the dough right after making it onto a parchment-lined cookie sheet and left it to chill overnight before baking them the next morning. I used Reynold’s Cookie Baking Sheets, which are the perfect size for my baking pans and make clean up immensely easier. You don’t have to chill these cookies though – you can bake and enjoy them immediately! When they first come out of the oven, the edges are a bit crispy, but as they cool, the cookies turn into the most wonderful texture – they almost have the texture of chocolate chip cookies, but the carrots add just enough moisture to keep them from getting too chewy. Instead, they’re super moist, with just enough chew and tons of flavor. 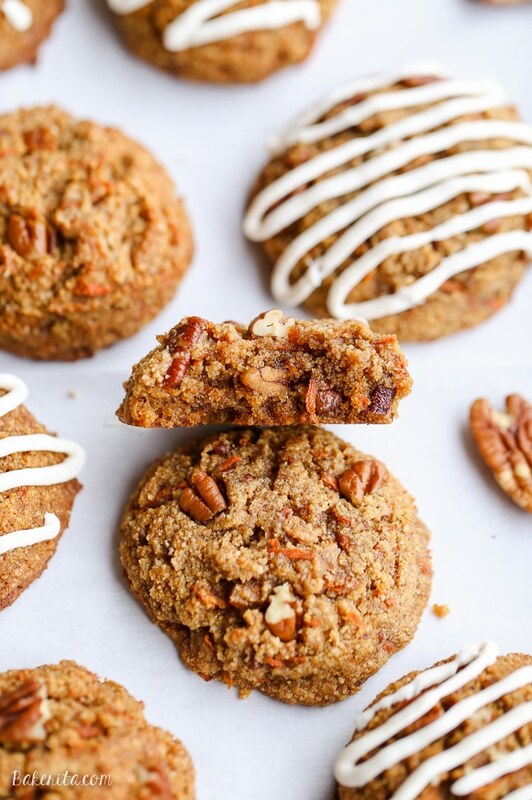 The cream cheese frosting isn’t essential (and these cookies are Paleo-friendly without it, BTW), but it really makes these taste like carrot cake! I recommend drizzling the glaze on while the cookies are still on the Reynold’s Cookie Baking Sheets – any mess you make with the glaze will be easily rolled up and tossed in the trash. That’s my kind of clean up! These cookies couldn’t be more perfect for Easter…or really any time you want carrot cake but don’t have a justifiable reason for making a whole cake. 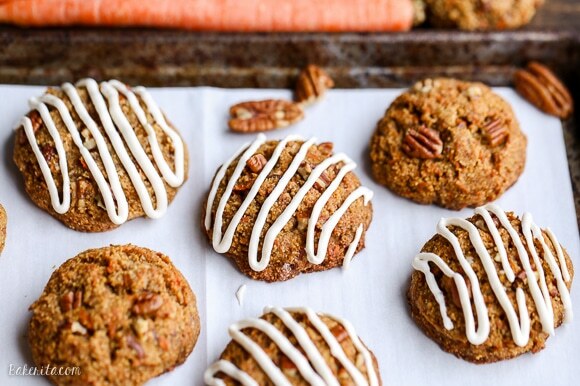 These carrot cake cookies will definitely satisfy the craving. Enjoy! Add the almond flour, salt, baking soda, and cinnamon to the wet ingredients. Mix until well incorporated. Fold in the grated carrots and toasted pecans. Cover with plastic wrap and refrigerate for at least an hour (can prepare up to 48 hours ahead of time). After refrigerating, preheat the oven to 350ºF. Use a cookie scoop to form cookies and press down slightly. Bake for 14-16 minutes or just beginning to turn golden brown around the edges. Beat the cream cheese in a stand mixer until softened. Add the maple syrup, milk, and vanilla extract and beat until smooth. Alternatively, combine all ingredients in a small food processor and pulse until smooth. Transfer the cream cheese glaze to a small piping or Ziplock bag. Snip of the end of the bag and drizzle over cooled cookies. Serve. These cookies are absolutely gorgeous, Rachel! I couldn’t wait to see the recipe after seeing your snapchat pics. Love how thick and fluffy they are! And that cream cheese glaze has me drooling! Oh my GOSH! This is total spring perfection and I’m kinda craving cookies for breakfast as of right now. ;) These are beyond gorgeous, Rachel!! Happy Friday! I once made a carrot cake scone, but I didn’t have a food processor at the time so I had to grate the carrots by hand. My hand really hurt afterward. Haha. These cookies look beautiful. Carrot cake is one of my favorite springtime desserts to. And I love the way you put on the frosting. Haha grating carrots by hand is the worst! But thankfully, these cookies make it totally worth it. Thanks, Amanda!! Oh my gosh these look so good I need to make these! Love these cookies. They look so good! Definitely have to try out your recipe this weekend. Thanks for such good “quality control”, its a tough job but someone has to do it, lol. These look soooo good, I want about 4 to go with coffee tomorrow morning! And maybe a little extra drizzle of the cream cheese glaze. Take care. I’ve so been craving carrot cake inspired food and these cookies aren’t helping! These look amazing Rachel and I’m dying to try them! Love how amazing these cookies look and the fact that they are gluten free and refined sugar free!! These look delicious! I do not have the GF ingredients on hand…could I use regular oil, sugar and flour? Holy YUM! 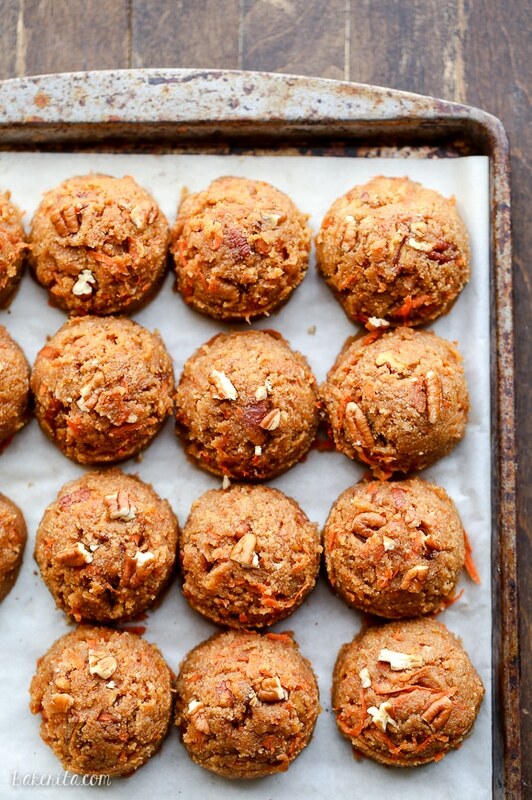 Combing the great taste of carrot cake in a paleo cookie form is a genius idea! These cookies are the bomb.com! Oh my goodness, I can see why you are all sorts of excited to share these cookies, because I am super excited to shove these into my mouth! I LOVE carrot cake AND cookies, so a combo of the two is all sorts of winning. And that cream cheese glaze?! Gah!! Forget about it! DROOLING! Pinned! Cheers, girlfriend! Thanks so much for all the sweet words and the pin, Cheyanne! I’m totally craving one of these carrot cake cookies for breakfast! They look delicious. Hehe “don’t have to grate anymore carrots.” OMGeee, I feel your pain!! I’m still laughing… can you hear me?!? These look so dang good… I’ve been thinking about them since seeing them on IG.. and craving them! That icing just takes these to the next level Love the coconut oil too.. always a favorite around here! Oh, and speaking quick clean up, have you tried silpat? They’re so versatile, reusable and with a quick wipe-down, clean up is a snap! Rob appreciates a quick clean-up… he’s my dishwasher! Of course it’s easier to con him with a cookie like this! Thank you for this Rachel! These cookies look SO puffy and SO moist! I love it Rachel! Alas, I was researching carrot cake several weeks ago and read reviews that when you use a food processor to grate the carrots, they are too big and don’t melt into your cake (or cookie, I assume) as well. So hand grating might be the way to go. Buuut who knows I never tried processing mine maybe I wasted time for nothing! 3/4 cup isn’t too bad though! You did a great job with these cookies. They look so inviting! Love the idea of carrot cake in cookie form. Easy to eat and all that flavor packed into these beautiful bites! What a great idea! Nothing beats carrot cake in spring :) I love that this recipe is grain free and refined sugar free, thanks for a great recipe! Carrot cake in cookie form? I say YES! Carrot cake is usually hubby’s request for his birthday but I just may have to surprise him with carrot cake cookies this year! These look perfect! These cookies look perfect, Rachel! Carrot cake is a favorite around here and in cookie form sounds even better! Love the cream cheese glaze and that they’re gluten free! Can you use regular sugar and AP flour ? Hi Brenda. I haven’t tried the recipe that way so I can’t guarantee it’ll work, but I think it would! I would use 1/2 cup light brown sugar + 1/4 cup granulated sugar in place of the coconut sugar and use an equal amount of all purpose flour in place of the almond flour. Enjoy! So I wanted to know if i could sub the almond flour for normal flour (I’m looking for a non-paleo version). Would this change the measurment for the flour, oil or sugar? Hi Allie, I haven’t tested this recipe with regular flour so I can’t make any guarantees but I’d just sub in regular flour 1:1 for the almond flour. Hope you enjoy them! HI!! I LOVE your recipes – we use your paleo chocolate chip cookie recipe at least once a month. My boyfriend wanted a carrot cake for his birthday and he can’t have standard flour, so we look to your site often. I was wondering if you’ve tried to make this into a cake? Is there a simple way to alter the recipe? Thanks again for sharing your recipes! Hi! I just made these cookies!! OH! MY! GOODNESS!!! They are so delicious!! Thank you for sharing!! So happy you’re loving them Kimberly! Thanks so much for sharing your feedback with me. Can I use whole wheat flour instead of the almond? I don’t use whole wheat flour so I’m not sure exactly how it would turn out, but it should work out ok! Can I use maple syrup instead of coconut sugar ? Hi Anita – I wouldn’t recommend it, because maple syrup is a liquid ingredient which will mess with the chemistry of the recipe and likely make the cookies too soft. Step 3 – refrigerate for 1 hour. Are you suggesting we leave the oven on for the whole hour?!? Hi Angie, thanks for noticing that. Just an oversight on my part, I’ll fix it now. 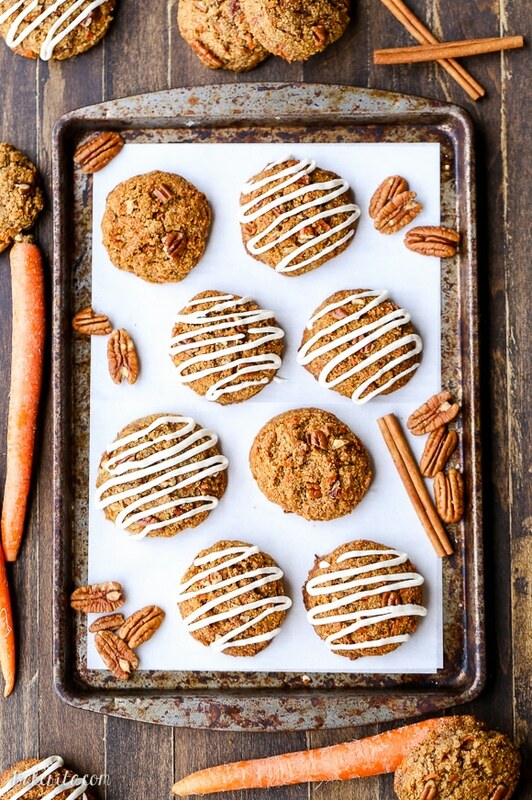 I was looking all over for a healthy carrot cake cookie recipe and am so glad I found these. I made these as instructed but used a bobs red mill egg substitute for the egg since I’m intolerant and added some raisins and they were great! These will definitely be a new staple in our house!